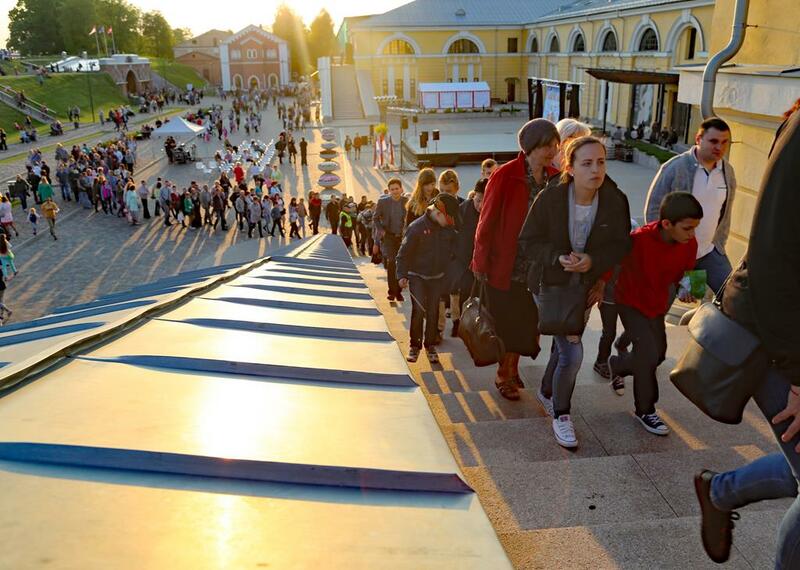 ﻿ NIGHT OF MUSEUMS 2017 "TIME LEVITATION"
On May 20th in the Night of museums from 19:00 till 00:00 Daugavpils Mark Rothko Art center invites visitors to break the boundaries of time and space and to experience a world-wide flight of fantasy, which are transmitted by artists from all over the world using art and music. The personal exhibition of Australian artist Richard Denny “Era of Silence” reflects the phenomena and the eternal problem of the 21st century – the endless variability of information that rises a lot of discussions or makes you keep silence. The Lithuanian project “X: CRITICAL BORDER – CHERNOBYL-30” reports on the boundaries between the past and the future, the monologue and the dialogue. The Chernobyl disaster opened a new period of human history, which at the same time became a challenge to the creative process in a format of a dialogue. History is the concrete and living reality – evidence of events in the past. The cultural and historical exposition about the history of the building of the arsenal with archival documents, photographs and memories of people will open the doors to the distant past, as well as remind about recent events. Is it easy to talk about the forms of emptiness or about the boundaries of time and silence of sounds in artistic expression? This question will be answered by artists of the Latgale region in the exhibition “Forms of Silence and Emptiness”. Time is an endless change. Variability is also characteristic for the silence, which is sought and portrayed by the artist Linda Zivere (Latvia, Denmark). In her solo exhibition “In Silence” the artist embodies herself with the help of an endless search for truth and silence. Time is an eternal value, just like the relationship between people. Personal exhibition of artist Sanri (Latvia) “Communication is the key” opens the door to the world of bright and emotionally full thought, speaking in the language of art. Real time, in essence, is a continuous link between the past, the present and the future. The artist from the UK, ERIN LAWLOR opens and closes the layers of her works like curtains, through which you can see suffering, love and the past that interferes with the present in her exhibition “ONOMATOPEIA”. The international art project “Concrete delusions” in the language of art will tell about the past of industrial and architectural evidence of transformation and integration into the modern cultural environment. The project is aimed at finding ways to use concrete, that is used in the environment of industrial and architectural fragments, that will turn this material into objects of aesthetic art. During the Night of Museums in the Rothko Center, one can see a photo exhibition, as well as a light and sound installation near the powder depot (Nikolaja street 1). The project is implemented by the German photographer and multimedia artist Manuel Schroeder in collaboration with the Minsk Center for Contemporary Art and the School of Design and Art “Saules Skola”. The desire to stop the ruthless course of events and find time for themselves, visitors will be able to realize in the recreation area “Time for themselves”, where, with the help of color and creative imagination, everyone will have the opportunity to get used to the role of the artist. All temporary exhibitions in the Night of Museums will be available for visitors free of charge. Permanent exhibition “Mark Rothko. Life and art “with the original paintings of Mark Rothko, as well as the original work of Edward Munch” Portrait of lawyer Ludwig Mayer “can be visited for an admission fee.